Sharing video highlights during the game is now possible for any spectator. TeamSnap, the household name in integrated sports management, announced today it is partnering with Fantag, a pioneer in video highlight technology, to debut video highlights on its popular TeamSnap Live! platform for the first time this fall. "Capturing and sharing video from a game - particularly the special highlights - has always been a disjointed, time-consuming process that required a volunteer to film, edit and then figure out how to send large files to the team days after the game," said Terri Schmier, Chief Product Officer, TeamSnap. "Even when amazing plays were captured by a spectator, they have almost never been shared. It has just been too hard. 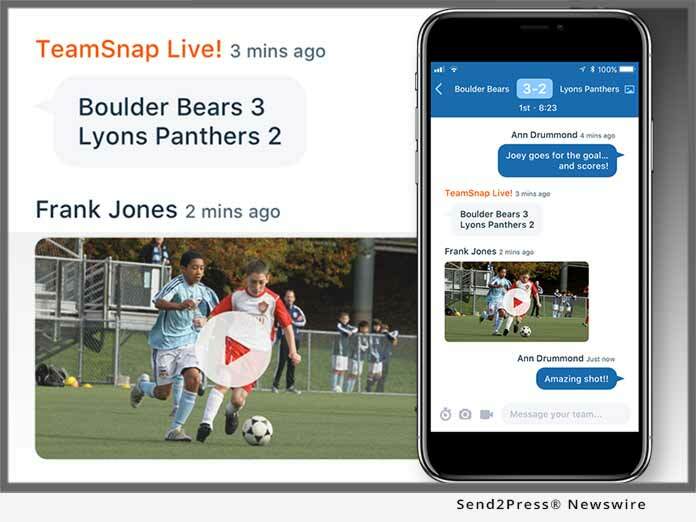 Now, with our Fantag integration, anyone on the sidelines or in the stands can record video, tag the exciting plays and instantly share highlights through TeamSnap Live! during the game." "We are really excited to partner with TeamSnap to help parents and other users capture video of those special moments in youth sports," said John Stone, CEO at Fantag. "Our technology complements TeamSnap Live! perfectly providing users with the ability to easily capture video and share it instantly with friends, family and teammates." To access TeamSnap Live! video highlights powered by Fantag, users must have the most recent TeamSnap iOS and Android apps installed. Fantag is the easiest, fastest, and most affordable way for organizations, schools and teams to manage all their video in one place - for hassle-free sharing of highlights, clips, replays, and reels. Using patented technology, Fantag automates the connection between video creators and video consumers. By delivering personalized highlights to a larger audience, Fantag transforms the fan experience and streamlines the content creator's workflow. The value of the video already being captured is significantly increased at the click of a button for everyone - whether a fan, player, parent, coach, athletic director, recruiter, sports editor or broadcaster. For more information, visit Fantag at https://www.fantag.live/.